There are a million things to do: You need to call the caterer, update your timeline with the photographer, make sure all the girls got their dresses fitted; All the while, your future MIL is nagging about the rehearsal dinner and your boss totally caught you on Pinterest instead of working on the project you were supposed to have finished yesterday. While all of these things need to get done, they can’t be done well if you’re rushing through each task like a madwoman. 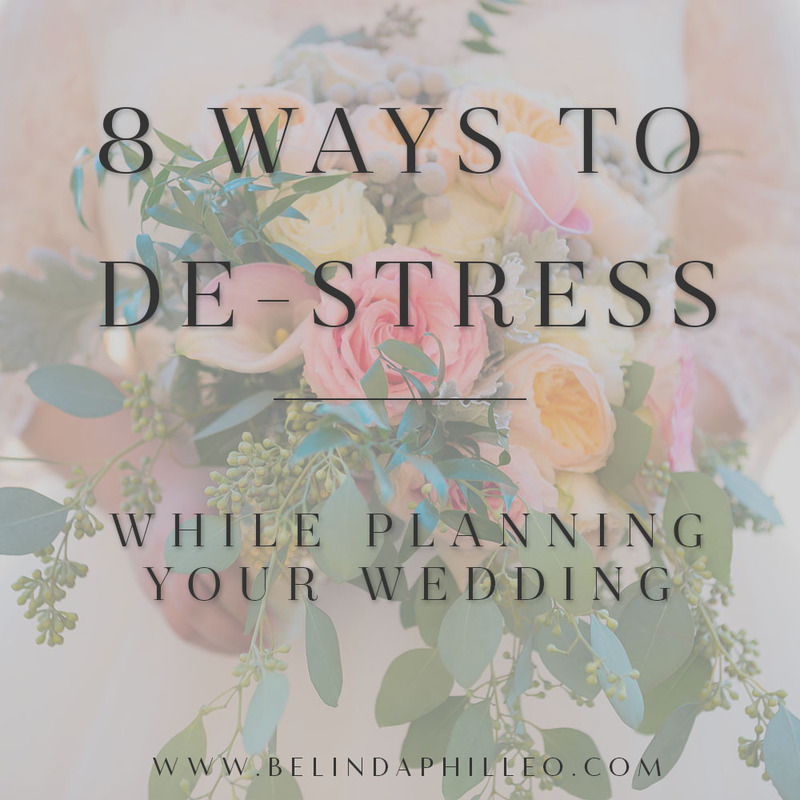 Today I’m going to cover eight things to help you stay balanced and de-stress while you plan your wedding! It’s so easy to get caught up in the fuss of planning the perfect, most memorable day that you lose sight of the entire purpose behind getting married. Plan a fun date with your fiancé to remind yourselves why you’re getting married in the first place. No wedding talk allowed. It can be easy to fall into a lazy slump when you feel like there’s too much on your plate, but part of staying healthy and stress free means keeping active. Exercising is a great way to let off steam. Keeping a regular routine will also keep you balanced. Even if you can’t fit in an official trip to the gym make time for some kind of exercise. Don’t forget that you are the BRIDE. If you don’t have a wedding coordinator, don’t fool yourself into thinking that you have to be one. The first thing you can do is hire vendors that you TRUST. This will take a lot of the weight off of you so that you can focus on the important things. Secondly, choose a designated “day-of helper.” Let’s say you forgot something important at the hotel, or perhaps you just need someone to make a last minute coffee run; Big or small, your “day-of helper” can be a life saver if something doesn’t quite go as planned. 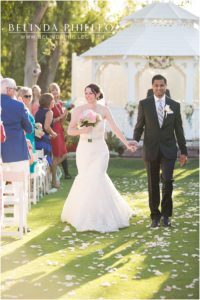 Ideally, you want to choose someone who is not already in your bridal party or family because they will need to be present during key moments and photos. Your go to person should be someone reliable and trustworthy. If you can’t think of anyone off hand, keep in mind there are professional Day Of Coordinators who do just this! Just like your fiancé, your friends can sometimes feel a little left out during the madness of planning your big day. Take time out to spend with your favorite girls, sans wedding talk. Let them know that even though your life is changing, you’re still here for them just like you always have been. Spending non-wedding related time with your besties will not only help you stay balanced, but it will also help you avoid drama. Maintain a balanced diet in the months leading up to your wedding. That being said, it’s OK to reward yourself with a treat every now and then- you deserve it. Plan ahead of time to have snacks and lunch available to you and your wedding party on the day of. Resist the urge to skip breakfast or lunch on your wedding day. The last thing you want is low blood sugar causing trouble. If you’re worried about having a nervous tummy, plan for light, healthy meals on the day of to keep you sustained. If you don’t already have one, buy a three ring binder with dividers and put everything related to your wedding in it. Keep a running checklist of what needs to get done, and who’s in charge of the task. Take it one step at time. Rome wasn’t built in a day and your wedding won’t be either. People get so caught up in the wedding machine…what brides don’t realize is that two things last: the pictures and the new family relationships. Other than that, a wedding is just a day. Did you enjoy these tips? Click here to have more delivered right to your inbox! What are some of your favorite ways to de-stress? Share your favorite tips in the comments! I love this idea, what a great article for your upcoming brides!!! Great thinking! Wedding day stresses can get really overwhelming! These are all great tips and so helpful for your couples!